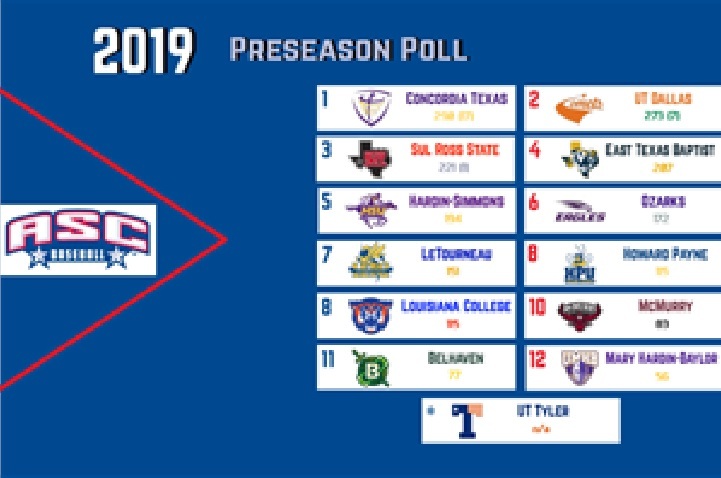 RICHARDSON, Texas – Concordia Texas has been picked to win the 2019 American Southwest Conference baseball regular season title after a vote of the league’s head coaches and sports information directors, announced by the conference office Wednesday. The Tornados received 290 points and 17 out of a possible 25 first-place votes to lead the ASC poll. The defending ASC regular season champions went 29-18 overall, and 18-6 in league play in 2018 and were the runner-up in the ASC Championship tournament. Concordia, under the ASC Coaching Staff of the Year and head coach Tommy Boggs, also made its second consecutive appearance in the NCAA Championship with an at-large bid. UT Dallas was picked second with 273 points and seven first-place votes. The Comets claimed their first ASC Championship in 2018 with a 32-17 record and advanced to the NCAA Tournament for just the second time in program history. Sul Ross State was picked third with 221 points and first-place votes. The Lobos tied for third with UTD last year, going 23-19 overall and 17-7 in conference. 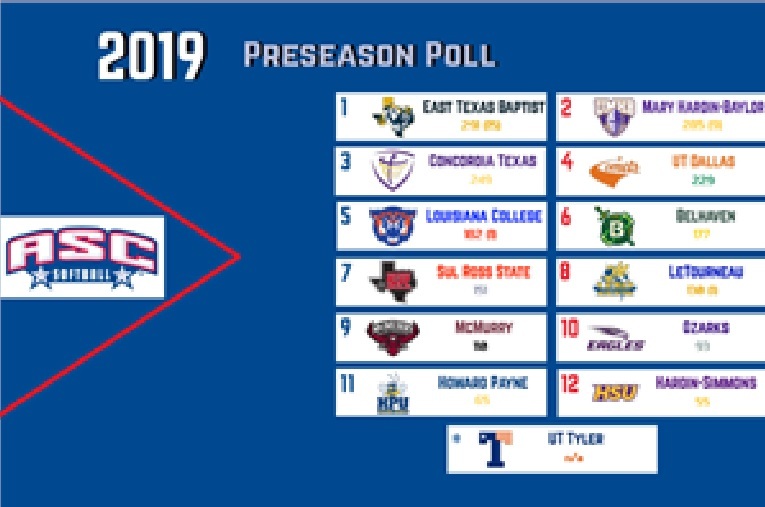 Rounding out the poll were East Texas Baptist (207), Hardin-Simmons (194), Ozarks (172), LeTourneau (151), Howard Payne (115), Louisiana College (115), McMurry (83), Belhaven (77) and Mary Hardin-Baylor (56). UT Tyler, the 2018 national champion, will not count in the 2019 standings and are ineligible for both the ASC and NCAA Championships due to the Patriots reclassifying to NCAA Division II. In addition to the preseason poll, a total of 26 players – 13 position players and 13 pitchers – were named to the ASC Baseball Preseason Watch List by the head coaches. Among the players returning for the new season are 14 all-conference selections, including ASC Newcomer of the Year and D3baseball.com Preseason All-America Honorable Mention Carson Cox (Cotulla, Texas) of Concordia Texas. Other returning All-Conference First Team selections from 2018 on the Players to Watch List include – Wesley Moss of Sul Ross State, Deauton Delgado of Louisiana College and Matthew Williams of Concordia Texas. The 2019 season is the 23rd in ASC baseball history and will start Friday, February 1 when Howard Payne will play at Hawaii Pacific. RICHARDSON, Texas – East Texas Baptist has been picked to win the 2019 American Southwest Conference softball regular season title after a vote of the league’s head coaches and sports information directors, announced by the conference office Tuesday. The Tigers are coming off their seventh consecutive trip to the NCAA Championship after going 33-13 in 2018 and 24-6 in conference play. They received 291 points and 15 out of 26 first-place votes. Defending ASC champion UT Tyler will not count in the 2019 standings and are not eligible for the ASC or NCAA Championship due to the Patriots reclassifying to NCAA Division II. In addition to the preseason poll, 36 players were named to the ASC Softball Preseason Watch List by the head coaches. Among the players returning for the 2019 season are 22 all-conference selections, including five first team member and the reigning ASC Player and Freshman of the Year – Ashley Perez of UT Tyler, and fellow Patriot Colleen Bentke, the ASC Pitcher of the Year. Perez, Bentke and UT Tyler’s Nicole Garcia were named Preseason All-Americans by Fast Pitch News. They join ETBU’s Morgan Arst and Mackenzie Anderson as the returning All-ASC First Team selections on the Players to Watch List. The 2019 softball season is the 21st for ASC softball. Action begins on Friday, February 1 when Hardin-Simmons and McMurry co-host the Abilene Round Robin. UT Tyler sophomore Matthew Cecotti (Lindale, Texas) won the 800-meter run at the UCO Open in Oklahoma in a field of 42 runners with a time of 1:56.10. His time ranks 39th in the nation and third in the South/Southeast Region. This is Cecotti’s fifth Track Athlete of the Week of this career. McMurry sophomore Sean Germany (Abilene, Texas) won the triple jump with a mark of 14.38 meters (47 ft.-2.25 in.) at the UCO Open in Norman, Okla. on Saturday. 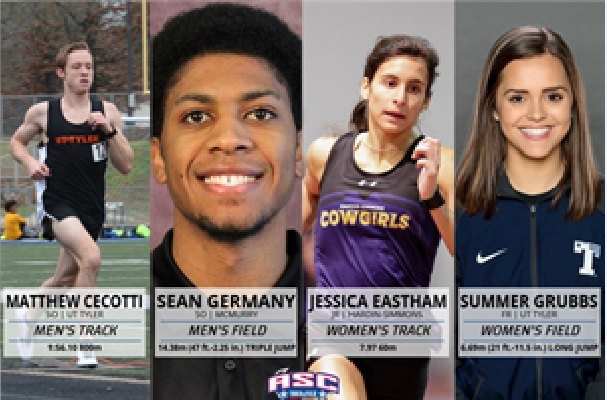 His distance ranks sixth in the nation in first in the NCAA Division III South/Southeast Region. Germany also had a long jump of 6.28 meters (20 ft.-7.25 in. ), placing fifth at the meet and ranking 15th in the region. Hardin-Simmons junior Jessica Eastham (Robinson, Texas) repeats as the Track Athlete of the Week after breaking the Cowgirl school record in the 60-meter dash with a time of 7.97 seconds at the UCO Open in Norman, Okla. She finished fifth in the finals with a time that ranks 46th in the nation and fifth in the NCAA Division III South/Southeast Region. UT Tyler freshman Summer Grubbs (Gladewater, Texas) repeats as Field Athlete of the Week after winning the long jump at the UCO Open with a leap of 5.54 meters (18 ft.-2.25 in.). Her distance ranks 10th in the country and leads the South/Southeast Region. Grubbs also ran the 60-meter hurdles in 10.37 seconds and the 400-meter dash in 1:03.28. LeTourneau freshman Jack Miller (Diana, Texas) became the top YellowJacket to land a top-15 national mark in the pole vault, clearing 4.75 meters (15 ft.-7 in.) at the McNeese Indoor II in Lake Charles, La. The score is the 12th-best in all of NCAA Division III and second in the region. LeTourneau sophomore Lorien Nightingale (Njoro, Kenya) earned a school record in the 800 meters at the McNeese Indoor II, finishing 10th with a time of 2:06.16. Ozarks sophomore Michael Harris (Elkins, Ark.) set a new school record in the 3,000 meters in 9:11.84 at the Pittsburg State Invitational in Kansas on Saturday. His time bested the old mark by five seconds. Harris’ new time ranks 20th in the South/Southeast Region. Hardin-Simmons junior Tanner Wright (Fort Worth, Texas) set a new Cowboy record with a long jump of 6.69 meters (21 ft.-11.5 in. ), placing second at the UCO Open. His mark ranks fifth in the region. LeTourneau freshman Kaylee Packer (Lewisville, Texas) set a YellowJacket school record by clearing 2.90 meters (9 ft.-6.25 in.) in the pole vault at the McNeese Indoor II in Lake Charles, La. Friday, placing third. Her mark is tied for third in the region. LeTourneau sophomore Ro Galloway (Texarkana, Texas) set a school record with a 200 meter dash time of 27.78 at the McNeese Indoor II, placing seventh in the event. Her time ranks 18th in the NCAA South/Southeast Region. Ozarks senior Hannah Smith (Blue Eye, Mo.) placed 38th as the only Division III runner in the 3,000 meters at the Pittsburg State Invitational. She recorded a time of 11:24.27, which ranks 41st in the region.